A new maker/haker space for South London. Ive increasingly found I need a better power supply while working on my Arduino projects. So here is my version of the standard ATX power supply conversion wrapped in a nice metal case I had laying around. 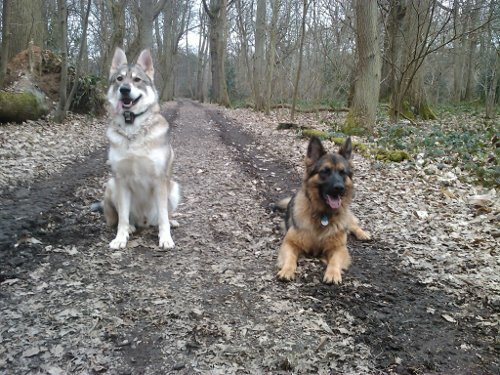 Chloe the German shepherd and Tika the Utonagan. Unfortunately we no longer have Chloe. But Tika is in great shape and a great companion. This is my take on the Arduino platform. It plugs directly on to the side of the breadboard bringing all the data and analog pins directly on to the board with the 5v and ground rails. Its my first home made double sided board and in fact only my second home made pcb using the toner transfer method. There are a few bits I can improve on the pcb layout such as movong more of the traces to the top side of the pcb. It took two attempts to get the top and bottom mask aligned but finaly I got them almost spot on. I thought I would combine it with my ongoing weather station Arduino project. Taking the xml generated by the Arduino project and displaying it on the home screen of my HTC Hero in a simple self updating widget. This is somewhere for me to publish information and details about any projects Im working on. So you will find some information about the Friends of Selsdon Wood, a group set up to look after a local woodland and also my hobbies. Like micro-controllers, programing and motorcycles.